Climate-controlled locker rooms and comfort stations reduce employee turnover. Workers in tough job sites like oil fields appreciate having a climate-controlled space to get changed or relax before heading back out to work. Separate shower and restroom areas on opposite ends to ensure privacy. 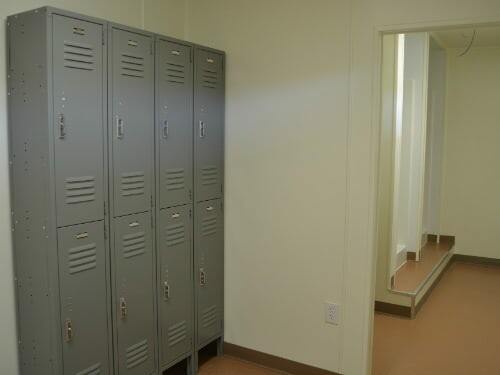 Sturdy, ready-to-use lockers and benches in center locker room area, so employees can relax, recharge, and secure personal items. Heavy-duty, steel construction that provides up to 25 years of useful life in any environment. Speedy deployment means Falcon delivers a turnkey Locker Room container to your job site in weeks, not months, avoiding delays common with free-form construction. Quick setup and relocation, because no steps, ramps, tie downs, skirting, or foundation is required (for most applications). 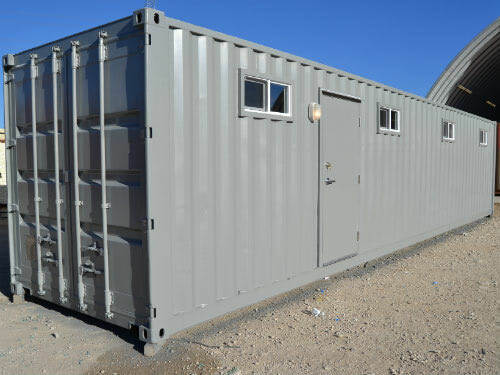 Built-in, plug-and-play electrical and plumbing connections get your shipping container up and running fast. Several employee comfort features come standard, including showers, sinks, toilets, climate control, electrical outlets, high windows for privacy, and more.